Breakfast, the important meal of the day should be fresh and nutritious. But due to hectic morning schedule, it becomes impossible to think of making one. And sometimes we are too lazy to enter the kitchen and make our own breakfast. While there are breakfast sandwich makers to help you make a healthy morning meal, you can complement it with a cup of coffee. 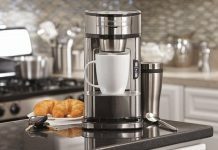 Also, read our review on the best single cup coffee makers. Bacon, egg and cheese sandwich is a popular breakfast in united states. But only the person who makes it knows how much time it consumes. You may require multiple pans, a toaster, a whisker and a lot more kitchen tools. Not only is it time-consuming, but you also have to wash those utensils after having your breakfast. And we know, no one loves to do that, so we are here with best breakfast sandwich makers of 2019. Let us not forget to mention one more quality of these little units. 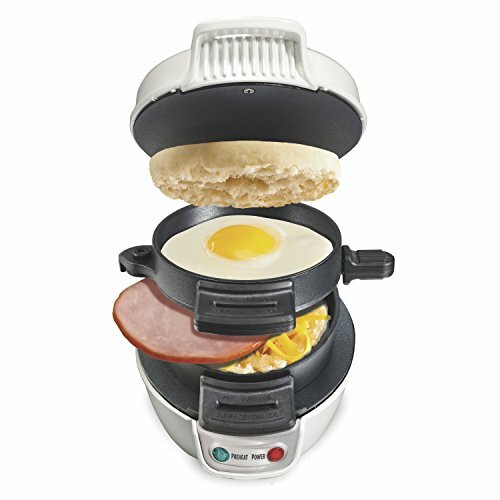 A breakfast sandwich maker is not limited to bacon, egg, and cheese only. There are numerous breakfast sandwich maker recipes that you can make using it. And most importantly, the price of these units are not too high and can be bought under a budget. 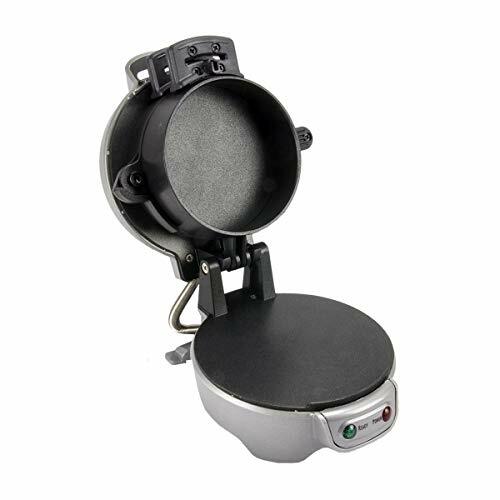 So start your day with a tasty and nutritious meal by getting the best breakfast sandwich maker. Say goodbye to that time-consuming method of preparing a meal with Hamilton beach breakfast sandwich maker. 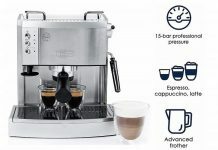 Small in size and powerful in performance, this Hamilton beach unit is perfect for people who are always on the rush. Thus, you can get your favorite bacon, egg, and cheese ready in 5 minutes. Also, you do not have to make use of separate pans for that. Just place all ingredients properly in place, close the machine and turn the power on. Once you hear a beep sound, slide the egg cooking plate out and there you have your breakfast ready. After enjoying delicious and nutritious food, now its time for clean-up. And cleaning up the Hamilton beach 25475A is a breeze as all removable parts are dishwasher safe. The cooking surfaces are non-stick so you can wipe them easily using a damp cloth. 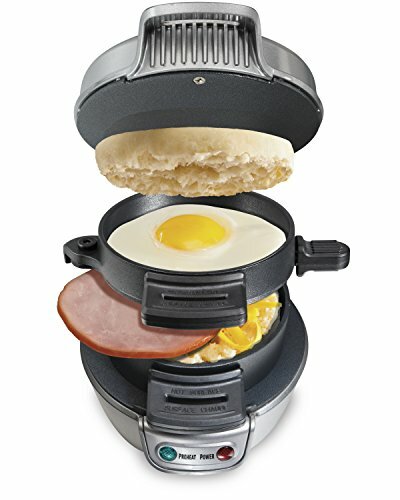 More than 3000 positive reviews on Amazon make it best Hamilton beach breakfast sandwich maker. It is also among one of the best selling products. Above all, the price of the unit will definitely not cause trouble on your budget. Preparing a meal for 2 people? Or want to enjoy 2 different styles of food? 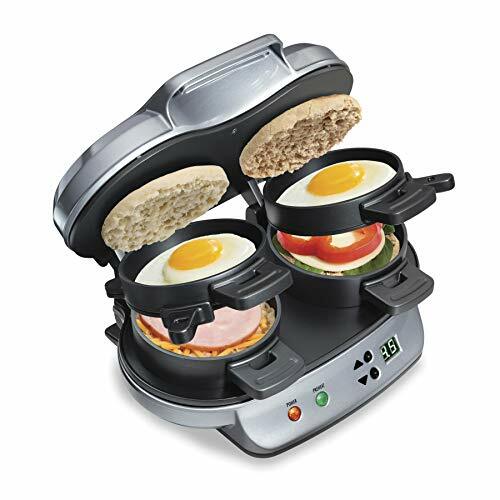 Then here comes Hamilton beach dual breakfast sandwich maker. This unit with double cooking surfaces can prepare 2 meals that too in 5 minutes. 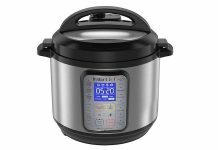 So if you and your partner are in a rush then this Hamilton beach 25490A is the perfect solution. 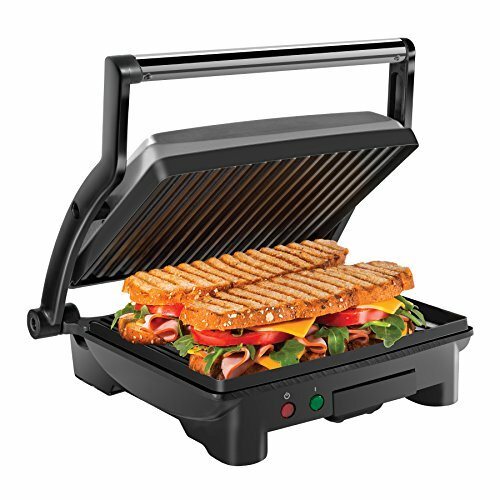 In fact, you can try out various sandwich maker recipes with this unit. Moreover, the unit comprises an in-built timer with a beep sound. It beeps a few times so that you do not forget to turn off the machine. All you need to do is, preheat a little, place bread on the bottom side and top it with your favorite ingredients. Then after, lower the top ring and cooking plate. Crack an egg onto the cooking plate and pierce the yolk. Finally, place the upper piece of bread and wait till the machine produces a beep sound. Once you hear the beep, rotate the cooking grate handle until it stops. Now you just have to lift the machine using an oven mitt and there you are, ready to enjoy your fresh, homemade and healthy meal of the day. Sometimes you want to add more than one ingredients in your sandwich. But small size breakfast makers don’t allow you to do that. However, Breville panini sandwich maker can be your suitable choice as it lets you make a bigger size of sandwiches. All thanks to its large cooking surface that allows you to place a big piece of bread without cutting it. In fact, you can fit 2 medium sized panini bread in this unit. The 1500-watt heating element heats up pretty quickly which eliminate the need of preheating. As a result, it helps you to make your meal fast and saves time. 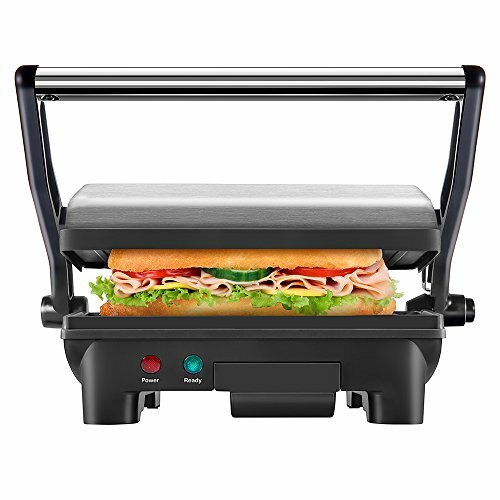 Adjustable height control of Breville panini sandwich maker allows you to move top plate into a range of positions. Therefore, you can hassle free grill thick artisan bread or toast, open style, and melt. While ribbed top plate gives beautiful grill marks on your food, a flat bottom plate evenly cooks food from the bottom. You can even cook eggs and pancakes on the bottom plate. 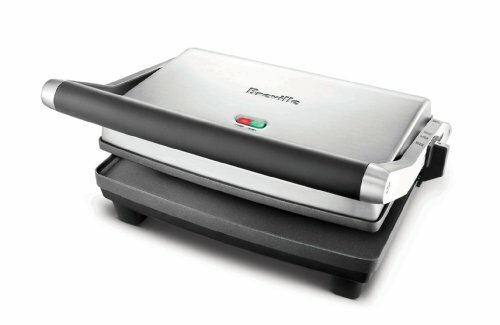 So yes, you can prepare a variety of food items with this panini sandwich maker from Breville. Good food along with great coffee is the best way to start your day. And to ease your morning routines we have proctor silex on our best breakfast sandwich maker reviews. The working method of this unit is same as above listed Hamilton units. You can expect your breakfast to get ready in 5 minutes. Simply choose your bread, like a bagel, English muffin or even a pancake and layer on the fixings. And the fixing can be an egg, cheese, precooked meat or anything you like. The proctor silex sandwich maker comes with recipes so you can have a wide range of different sandwiches in your breakfast. It also enables you to add a variety of fresh ingredients and make healthy or hearty food as you like. Cleaning this sandwich maker is very easy. Just remove the parts and place it inside a dishwasher. While you can wipe both the cooking surface with the help of damp cloth in order to remove oil. And most importantly, the price of the product is not too heavy on your pocket. If the durability of the unit is your first priority then here’s a perfect product. This Hamilton beach sandwich maker has a sturdy construction that will last for years. Not just that, it also comes with 150 best breakfast sandwich maker recipes to make your morning meal more interesting. With the help of the recipe book, you can cook sandwiches with English muffin, biscuits and more in just 5 minutes. In addition, each layer of the unit cooks ingredients perfectly while a slide-out plate helps to assemble all layers perfectly. Less price of the unit makes it perfect to gift the ones who love. They will remember you every time they use the sandwich maker. And a recipe book will encourage them to try out different types of ingredients while preparing the food. The book also offers a wide range of recipes that go from breakfasts to lunches and dinner to late night snack. So relieve your hunger with healthy food by using Hamilton beach breakfast sandwich maker 25475 Firefly. Waffles are the first choice of children and some adults too. But however, eating waffles every day is not too good for health. 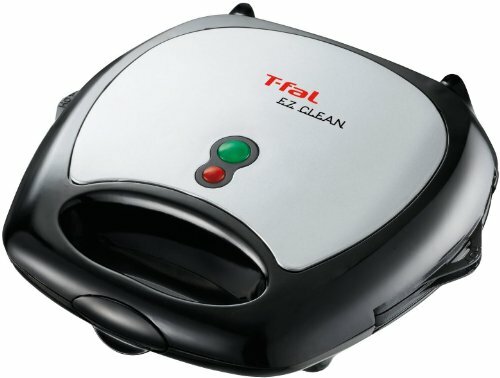 So we have a wonderful product from T-fal on our best breakfast maker reviews. It comes with 2 sets of interchangeable plates, one for a sandwich and another one for waffle. Therefore, you can change plates according to the type of food you want to make. Thanks to the 4-side locks that helps to keep plates in place. And simply unlock it to change or remove the plate. T-fal waffle sandwich maker provides an area to safely wrap and store the cord after use. Also, both the plates are non-stick as well dishwasher friendly. Also, check our in-depth best waffle maker reviews for more such products. Moreover, indicator lights on the top of the unit indicate if the power is on. While other lights glow when the food is prepared for cooking. 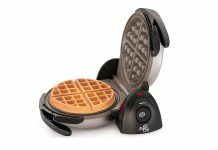 Thus, user-friendly features of this waffle and sandwich maker make it one of the amazon’s choice product. 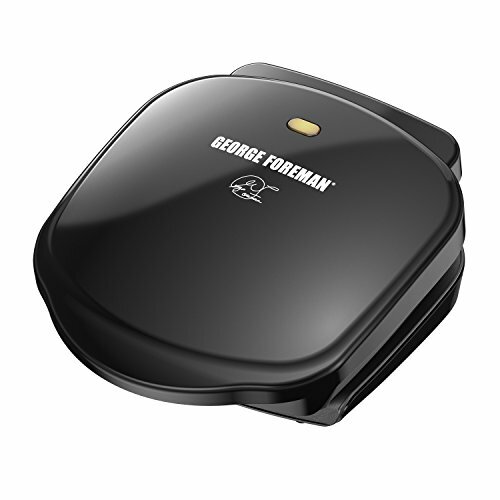 Compact design of George Foreman grill sandwich maker is perfect for small countertop space. And in spite of being small in size, it can fit 2 servings of your grilled favorites. Unlike other models that have a flat design, this unit has a slope design. This design of slope on the lower part helps to remove up to 42% of fat. As a result, your food becomes more healthy and nutritious to eat. And surprisingly, it is an excellent sandwich maker under $20, which is not at all tough on your budget. Are you worrying that slope design of this grill sandwich maker will create a mess on your countertop? Then leave all your worries as it comprises of a drip tray. This dishwasher-safe drip tray collects excess fat and grease so that your countertop remains clean. Once you turn off the machine, let it cool for around 15 minutes and then you can remove the drip tray. Throw the grease into the sink and place the tray on the top rack of a dishwasher. So both cooking and cleaning is a breeze with this sandwich maker. Here comes another Hamilton product but this time its a panini sandwich maker. The 10″ X 8″ non-stick grids allow you to cook 2 large size panini bread at once. Also, you can grill food of any thickness. Thanks to its cafe-style floating lid that evenly presses any size of the sandwich. However, you cannot remove the grills as they are in-built. But as they have a non-stick coating on them, you can easily wipe them off using a damp cloth. Whereas, the stainless steel construction of the unit will surely last for years. Just like the majority of Hamilton Beach sandwich makers, this unit also has indicators. These indicators are for 2 different purposes, one for power and the other indicates preheat. Do not worry about storage of the unit as you can store it vertically. As a result, it saves a lot of storage space that can be used for different things. Apart from that, the weight of the device is not too heavy to handle and the same goes for the cost. Thus, it stands as best panini sandwich maker in our review list. Making breakfast can be messy if you’re going to grill juicy foods. But you can avoid cleaning stubborn grease if your unit includes a drip tray. So we have a panini sandwich maker from Chefman that comprises a drip tray. This tray collects grease and excess liquid coming out from the food. Therefore, this saves your time as you do not have to give more time in cleaning. In fact, the tray is completely removable as well as dishwasher safe. 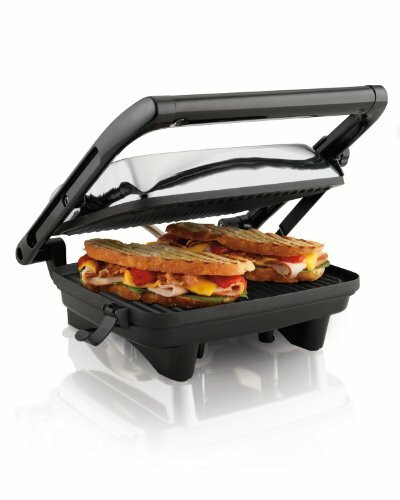 Floating hinge of Chefman RJ02-180 panini sandwich maker adjusts to accommodate any size sandwich. So no need to cut down your favorite ingredients. Also, easy and fast operation of the machine helps you to cook food fast. Hence, which makes it the best sandwich maker for parties or a family event. 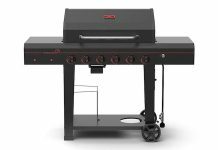 Other than that, the grill opens completely flat so that you can grill more than just bread. Coming to its price which is under $30 is only going to make this deal sweeter for you. Last on the list we have another chefman panini sandwich maker. But it is not only a panini maker as large cooking surface of the unit can fit more than just panini. In fact, it is a multi-functional machine that can do panini press, contact grill, and lay-flat grill. The machine opens 180 degrees for increased capacity and flexibility. So yes, you can cook a variety of food with this little yet powerful unit. It is an excellent low-cost sandwich maker that you should not miss. Moving on, the large cooking surface can fit 4 sandwiches at once which makes it the best sandwich maker for parties. Secondly, it comprises of a drip tray which is both removable and dishwasher safe. As a result, it reduces your effort while cleaning the device. The non-stick coating on cooking surfaces equally helps in fast cleaning. Just wipe both the surfaces with a damp cloth once the unit cools down. Apart from that, it is cETL approved with advanced safety technology for long lasting durability. Therefore, which means the product is both durable and safe to use. I don’t have to tell you that breakfast is the most important meal of the day. These budget sandwich makers are perfect for home use. 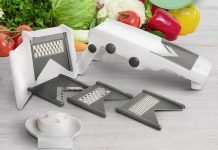 For chopping the vegetables you should use a mandoline slicer. They are fast and convenient. Hence, get one of those sandwich makers for yourself and never miss breakfast again.